In Dawn of War 3, the primitive and brutal orcs live in a society in which mainly physical size and strength count. They also compete with each other to determine who owns the biggest weapon or the fastest vehicle. Their equipment is based on fast scrambled scrap, which actually works only through its deep faith in the Waaagh. Nevertheless, some of the green skins even have magic that they use brutally against their enemies. There should be some well-known classes in your Ork army. However, even new ones are added and the scrap on the battlefield gets an enormous importance for your strategy. Your units can search for a shotgun to quickly and spontaneously upgrade the orcs' weapons. - Gretchin: The small Gretchin are your tried-and-tested unit and can directly assemble vehicles and buildings from scrap. - Boyz: Good standard infantry for melee. The young can build better armor by scrap and motivate their allies by war cry. - Deffgun Loota: Range unit, which can cause damage in a line. Collect scrap, slow down enemies by bombarding them. - Shoota Boyz: The normal ranged infantry of the orcs. They can use garbage to make shells. - Tankbusta: As the name suggests, this is an anti-tank unit with thick rocket launchers. By scrap they can create a squig kamikaze, which explodes with the enemies. - Nob: Very large Orcs for melee, which can mock enemies to pull the fire on them. In addition, they can slow down enemies by storm attacks and build themselves by scraping axes, which also slow down. - Trukk: A transporter with which you can catapult a group of Orks directly into the battle by slinging enemies to paralyze enemies. Use the Trukk to replace fallen units. He is weakly armored, but by scrap you can get a shield. - Big Trukk: Not a squad carrier, but a gigantic long-range artillery. This must first be set up before the bombardment and can be placed at a distance by means of scrap metal mines. - Deffkopta: Fast flight unit, which always threatens to crash and can get a saw blade by scrap which is very effective against infantry. - Killa Kan: A classic of the orc army. With this heavy mech, you can rock missiles and scrap them for a short time to increase the number of them. - Deff Dread: A melee mech that can be used to slow down hostile troops and cause damage to its debris even after its death. By scrap it receives a temporary shield, which additionally increases its speed. - Scrap metal: It cannot be said often enough. Use scrap, because it makes your units better, you can build towers or even completely new machines from the ground. - Slow down opponents: A lot of abilities of the orcs can limit your enemies. Use this, because they can get your distance fighters heavier or they cannot run away from your boys. - Fleeing opponents: By slowing down, you can easily follow fleeing opponents. This will allow you to inflict the damage to the enemy army. - Buffs: The orcs can spur each other up. Through their elite units or individual abilities of the troops you receive bonuses, which can make the difference in a fight. The orcs are very suitable for fast storm attacks. You must take losses as some orcs fall before they reach their enemies, but they don’t send blindly into battle. Your melee is tremendously strong and therefore you can combine this with the artillery. - Level 8: You can also use the alternative elite doctrine as an army doctrine. We show you what skills and doctrines possess the elite units of the orcs. A real alternative to the numerous fags of the orcs. Zapnoggin is a psyker, who can create an early advantage in the game through powerful spells. - Ere We Go (active): A teleport spell that takes Zapnoggin to a destination, while causing damage to enemies over time. While the spell is channeled, the damage occurs in a circular area, and the hero is teleported to that location with his allies. - Scrap Blast (active): It's about scrap again. By this ability, scrap shards are shot in a cone on your enemies and allies get a shield. The more cargoes of junk Zapnoggin, the higher the range. - Fist of Gork (active): Use a cargo scrap to hurl a large chunk on your enemies, who are harmed and paralyzed. - Scrap Shield (passive): Your collected scrap becomes a shield that orbits the heroes and regenerates faster near speed stations and increases the speed of movement. - Level 1: Elite Doctrine Zapnoggin’s Presence - Tower Recall: If Zapnoggin is on the field, Lootas can teleport to the next Waaagh Tower. - Level 3: Alternative Elite Doctrine Zapnoggin’s Command - Bigga Scrap Shield: Your killabot units can create a shield of scrap pieces that can absorb shots. - Level 8: Army Doctrine Zapnoggin’s Command - Bigga Scrap Shield: You now receive the doctrine without the elite unit as an army doctrine. This elite unit accompanies you at the beginning by the singleplayer and is partly untypical for the orcs. Gorgutz is strong, big, brutal, evil, green, and violent, which is very praiseworthy, but he is also very clever. However, don’t let this disturb you, and bring you into battle with him! - Loot (active): You can upgrade Gorgutz with scrap for a short time. This can improve its ability Spinnin’ Klaw at end fireworks, which heals units and increases their damage and speed. - Spinnin’ Klaw (active): Gorgutz hurls his metal claw around him and creates a swirl. This protects your troops from incoming missiles and deals damage to enemy units. In addition, enemies are slowed down and Gorgutz cannot attack as long as the ability is active. - Grapplin’ Klaw (active): You throw the claw of Gorgutz to a destination, which can catapult the elite unit to the first, hit enemy. As soon as Gorgutz comes up, he forces surrounding enemies to attack him and inflicts damage to them. - Critical Strike (passive): Through every sixth close-range attack, Gorgutz deals damage to all enemies in a line. - Dirty Fightin’ (passive): Close-range attacks create area damage and reduce enemy damage. - Level 1: Elite Doctrine Gorgutz’ Presence – Healin’ Waaagh! : As long as Gorgutz is on the field, Waaagh towers can add healing through their WAAAAAAGH !!!!!!! ability. - Level 3: Alternative Elite Doctrine Gorgutz’ Command – Keep Trukk’n: When units are thrown from a Trukk, they receive a temporary shield and slow their opponents. - Level 8: Army Doctrine Gorgutz’ Command – Keep Trukk’n: You now receive the doctrine without the elite unit as an army doctrine. The Big Mek Wazmakka is more a supporter than a one-man army. Nevertheless, he can very well hold territory and get a lot out of the boyz. He creates scrap for his allies and can also use it against enemies. - Orbital Scrap (active): You have a cargo scrap from the orbit to the battlefield. This produces damage and has three charges. - Loot (active): You create a load for Orbital Scrap By scraping around. - Scrap Turrets (active): Wazmakka creates from the nearest five shotpins protected towers, which bombard his enemies with scrap metal. These are destroyed when the ability ends. - Traktor Beam (active): You create a beam that damages enemies and provides shields to allies. Both groups are slowed down. - Level 1: Elite-Doctrine Wazmakka’s Presence – Scrap Turrets: As long as Wazmakka is on the field, the wrecks of destroyed, allied vehicles are transformed into a scrap-tower. - Level 3: Alternative Elite-Doctrine Wazmakka’s Command – Scrap Sight: The map can be uncovered briefly by destroyed vehicles. You get visibility around the wrecks. - Level 8: Army Doctrine Wazmakka’s Command – Scrap Sight: You now receive the doctrine without the elite unit as an army doctrine. A very robust mech for melee, with which you can start surprise surgeries, as it can attack through tunnels. - Tunnel (active): Your Mad Dread digs a tunnel to a destination and hurls back enemies. In addition, damage is caused and Mad Dread can move through enemies at short notice. Your other units can also use the tunnel. - Rampage (passive): If the life points of Mad Dread sink to zero, he falls into rage and receives a shield. If he spends enough damage during this time, he is healed, but Mad Dread is defeated when the shield breaks. - Cleave (passive): Mad Dread meets all the enemies in a cone. - Critical Strike (passive): With every sixth hit Mad Dread damages all opponents around him. - Loot (passive): If Mad Dread runs over scrap, he will be healed. This effect is disabled as long as Rampage is active. - Level 1: Elite-Doctrine Mad Dread’s Presence – Even Long WAAAAAAAGH!!!!!! : Of the WAAAAAAGH!!!!!! Buff the Waaagh-Towers holds longer when Mad Dread is on the field. - Level 3: Alternative Elite Doctrine Mad Dread’s Command - Hit ‘n Run: Have Killa Kans A full charge rockets, they get a shield. If their missiles are fired, they receive a speed bonus. - Level 8: Army Doctrine Mad Dread’s Command - Hit ‘n Run: You now receive the doctrine without the elite unit as an army doctrine. The most powerful weapon in the army of the Orcs is Beauty da Morkanaut. 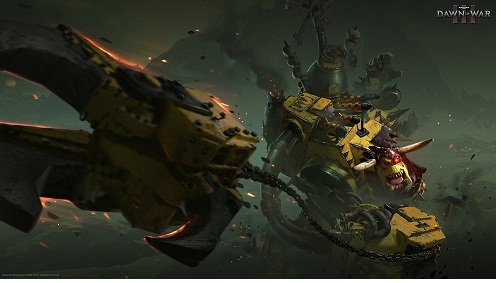 This mechanical giant has already been found in earlier installments of Dawn of War. With it you can protect your troops from damage and he will plug in a lot, before he goes to the knees after a million bullets, rockets and shells. - Rokkit Fist (active): Beauty hurls his fist at a destination and damages and paralyzes his enemies. Then you can return the fist and throw back all enemies on their way. - Kustom Force Field (active): You create an energy shield, which can be used to ward off your enemy's attack and damage surrounding enemies. If the ability is activated again, you can activate Mega Blast. This makes Beauty's shots on his main shield, but they create a new one on impact. - Loot (active): You collect scrap to get a load for Gretchin Repair Squad to create. - Gretchin Repair Squad (active): This ability has four charges and calls a small group of grots to repair beauty or other commands. - Reinforcement Point (passive): In the vicinity of Beauty, fallen squad members can be replaced by allies. - Level 1: Elite-Doctrine Beauty’s Presence - Betta Repair: If the Morkanaut is on the battlefield, Grots units can repair faster and the units suffer at this time less damage. - Level 3: Alternative Elite Doctrine Beauty’s Command – Kustom Force Fields: Waaagh towers can create a shield with which projectiles are stopped as long as the WAAAAAAGH !!!!!! ability is charged. - Level 8: Army Doctrine Beauty’s Command - Kustom Force Fields: You now receive the doctrine without the elite unit as an army doctrine. The orcs are much more tactical than one might expect from a large green bunch of bats and they have much protection and support.